Australia’s Scenic Public Toilets #29 – Crocodile Cruise Conveniences! Maybe the multiple crocodile sightings did it. Or the 70 km (~45 miles) cruise from the Timber Creek landing to the middle of nowhere. Or perhaps the sunset drinks and snacks, taken incongruously in the middle of the crocodile-infested Victoria River were responsible. Whatever it was, the public amenities on the purpose-built pontoon where we took a break from crocodile spotting to admire the staggering view were most welcome. And while they’re not really PUBLIC – use of them comes with passage on the excellent Victoria River Cruise run by Timber Creek locals, Neville & Meredith Fogarty – they’re undeniably scenic! With an added frisson of excitement – and uncertainty – from the crocs that may – or may not – be lurking all around. After watching a couple of 5-6 metre crocodiles disappear from the riverbank into the water without a trace further upstream, the crocs could be anywhere! And that included right under our pontoon!! Praise be for heavy duty steel!! But after an event-free hiatus aboard the pontoon – that is, if viewing the 360° splendid grandeur of Australia’s wildest river while eating a splendid spread of nibbles washed down with drinks doesn’t count as an ‘event’ – we returned to Timber Creek as the sun set and the moon rose over the river. With a panorama so heart-stoppingly magnificent the crocs were forgotten! It’s a pleasure doing business here – and in all the others! Have I included YOUR favourites? Grab a copy and see for yourself! 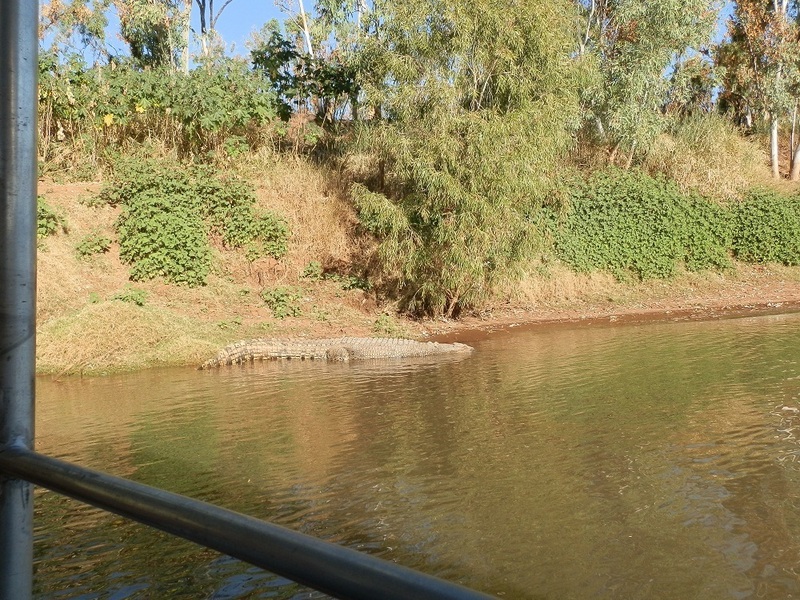 You sure did see some big crocs, at least that one in the picture looks big…. huge! Beautiful sunset! @Dianne – Who cares about the crocs when the view is this good?! @Iris – Yes, it’s edging out Lord Howe Island as my favourite!! @FruitCake – And even more so in reality!! @River – Yes, these are the rewards of retirement. I’m so lucky I got to retire early!! 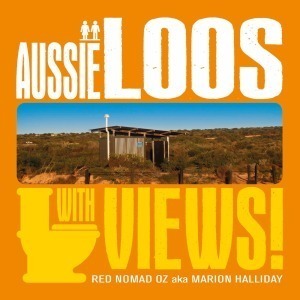 @eileeninmd – Loos with views are my specialty!! Hope your week is good too! @SaucyKod – Hahaha, great story about your dad! Thanx for the loo pix, will reply soon!!! @Aleah – Yes, it’s all about the experience!!! @TMWH – Hahaha, you’d be stuck in the middle of a Catch22 all right!! @Lauren – C’mon! What’s a few crocs between you & the water?!?! @Fun60 – Haha, the meaning of life is all around you here!! @Taken For Granted – Thank you!! The watching was fun – just glad it didn’t turn interactive!! @Rohrerbot – The crocs are just a part of life in the far north!! But … I’m glad they kept their distance!! @Windsmoke – The moonrise was an unexpected bonus!! Wow. That sure is a true #1 loo!!! Or rather, the! I’ve kayaked with 5-6 foot gators and never thought much about it. Meters seems like a whole different thing. As in take a chomp out of a little pontoon boat sort of thing. But for that scenery I would chance it too. Did you ever get to use that loo? I would definitely go there even though I don’t need to go. It’s such an interesting place to have a toilet! Had to laugh at those pontoon loos …. I guess. If you’ve got to go … You’ve got to go ….. what a view ! What gorgeous photos, especially that moonrise! It might make me seasick to go in that floating loo, but I suppose that is the right place to get sick! At my Dad’s camp in the Canadian Woods, he would sit in his “LOO” in the early evening, reading the newspaper, with rifle in lap, waiting for that big BUCK to walk through the apple orchard – Yep, you guessed it. Holy CRAP, he shot the bugger one night, and I can still see him running towards the buck, holding onto his pants. Funniest thing ever. Shoulda had a video. Great Stuff as usual Red, hope you got the photos I sent of new LOO in my neck of the woods. Take care now and have a great day. I’ve always enjoyed a loo with a view, and this one is just fine. Croc watching on the river sounds like great fun. As always your photos are excellent. How cool, a loo with a view! Wonderful cruise, the moon shot is lovely! Have a great week ahead! That has to rate as the best loo around although I don’t think I would want to sit there for too long pondering about the meaning of life. A Victoria River Cruise is on my list! I can’t wait to retire. I’m planning a holiday per year. The moonrise and sunset look phenomenal, Red. Bonza photos i especially like the sunset and moonrise over the river. No, no Red. Never forget the crocs. Your timing to see the moon rise was good. “Scenic public toilets”…that is so funny, OZ. Can’t imagine crocs swimming around the one on pontoons. You lead quite the adventurous life. Great pictures, as always.